President Ho Chi Minh, who was a leader of genius, hero of national liberation and great man of culture, left our whole Party, people and military an invaluable asset – Ho Chi Minh’s thought. This is a system of comprehensive, deep viewpoints on fundamental issues of the Vietnamese revolution; a result of creative application and development of Marxism-Leninism in our country’s conditions; inheritance and development of fine national traditions, and acquisition of the quintessence of human culture; and an invaluable spiritual asset of our Party and people. President Ho Chi Minh devoted his whole heart and mind and efforts to finding ways to save the country and directly leading the Vietnamese revolution to final victory. Therefore, the ideology on military and national defence represents an organic element and occupies a position of importance in his revolutionary ideology. Realities of the Vietnamese revolution have revealed that Ho Chi Minh’s thought on military and national defence is very diversified and profound. It not only created core values in the August General Uprising in 1945 and previous national liberation revolutions, but is of enduring value to and a guideline on building the all-people national defence and people’s armed forces, and firmly defending the current socialist Fatherland. Consequently, applying Ho Chi Minh’s thought on military and national defence to the cause of national building and defence in general, and development of specialized strategies in particular, including Vietnam’s Defence Strategy and Military Strategy in the new era, is a matter of significant importance. To this end, it is important to have a thorough understanding of core values embedded in Ho Chi Minh’s thought on military and national defence, and apply them to each strategy in an appropriate, effective manner. 1. Ho Chi Minh’s thought on political guidelines, military guidelines and political goals of Vietnam’s people’s warfare. 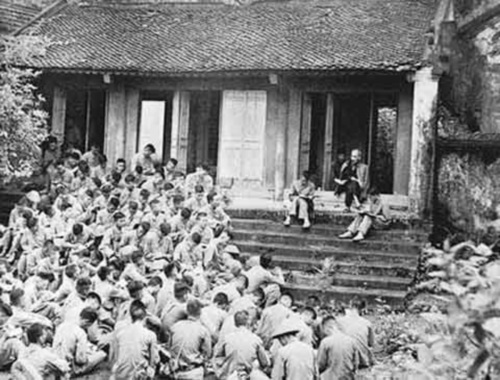 Thoroughly grasping the standpoints of Marxism-Leninism on revolutionary warfare and the popular principle: “war is the continuation of politics by other means,” Ho Chi Minh affirmed that political guidelines determined the military ones; military attached to politics; and political goals of people’s warfare were to implement the goals of the Vietnamese revolution. Specifically, he placed special emphasis on soundly handling the relationships between military and politics, and between politics and war. He also underlined the decisive role of politics in every military and warfare activity, including the development of strategic guidelines and forces, conduct of struggle, and so forth. Drawing from theoretical points of view: “politics is more important than military” and “taking politics as the roots,” he concluded that “military without politics was like trees without roots, both useless and harmful.” It means that every military organization and activity has to comprehend and comply with political guidelines. He also pointed out “military’s submission to politics.” It was not vague politics but the “politics in combat.” Successful settlement of military issues aimed to fulfill political goals of warfare and revolution. According to Ho Chi Minh, the highest goals of the Vietnamese revolution were emancipation of the country, society and people; and national independence and socialism. Those objectives stipulated the political goals of Vietnam’s people’s warfare, namely “launching the wars of resistance to smash the imperialist and feudal rule, liberate the country, bring true independence and unification to Vietnam, establish a new democratic regime, and strive for the establishment of socialism and communism.” “Taking politics as the roots” was also clearly reflected in the building of Vietnam’s People’s Army (VPA) imbued with nature of the working class, and with a focus on politics. This is one of core values of Ho Chi Minh’s military thought and a fundamental principle guiding every force and military activity in people’s warfare. Theoretically, practically and methodically, it is also of significant importance in the cause of national defence and the socialist Vietnamese Fatherland protection in the new era. Ho Chi Minh’s aforementioned point of view deeply reflects principles and laws on building revolutionary forces and people’s armed forces, providing the basis for bringing into play the integrated power of Vietnam’s people’s warfare to gain glorious victories in the two wars of resistance against French colonialists and American imperialists. At the same time, it also serves as guidance on building robust defence forces, particularly on building the VPA into a revolutionary, regular, elite, and gradually modernized force, fully capable of satisfying the demands of safeguarding the Fatherland. 3. Ho Chi Minh’s thought on the all-people armed uprisings, all-people warfare, military art of all-people fight against the enemies, and taking the armed forces as the core of the struggle. On applying Marxism-Leninism viewpoint on revolutionary violence to concrete conditions of our country, Ho Chi Minh clearly specified that the way to seize power in Vietnam was by means of armed uprisings. His new, creative developments were to organize all-people uprisings, in which the alliance of workers and peasants played the core role; closely align political struggle with armed struggle; and from partial uprisings to general ones to take power for people. Right in the Instruction on the Formation of Vietnam’s Armed Propaganda Unit for National Liberation, Ho Chi Minh clearly stated that “our war of resistance represents the struggle of the whole people, thus requiring mobilization and armament of the whole people.” The fundamental principle of Vietnam’s people’s warfare is all-people wars of resistance, inclusive wars of resistance, protracted wars of resistance, and primary reliance on the people’s power. The standpoints on people’s warfare; arming the whole people; all-people fight against the enemies; reliance on the whole people’s power; wars conducted by the whole people; attacking the enemies every time, everywhere and by any weapons; and creating and exploiting the country’s integrated power are special features in Ho Chi Minh’s military thought. Only by doing so could we defeat professional colonial and imperial armies, whose military, economic capabilities were far more powerful than ours. On assessing President Ho Chi Minh’s contribution to the Vietnamese revolution, “President Ho Chi Minh’s greatest contribution to revolutionary theories and methodologies is the theory of people’s warfare,” said Prime Minister Pham Van Dong. His thought is not only of great value to the wars but also lays the foundation for guidelines on the building of all-people national defence in the cause of safeguarding the Fatherland. 4. Ho Chi Minh’s thought on primary reliance on the people’s power; exploiting national power in conjunction with power of the times; more friends, fewer enemies; and generating integrated strengths to triumph over every enemy. Carrying on the national tradition of independence, self-mastery, self-reliance, and resilience, Ho Chi Minh advocated mostly relying on the people’s power when launching wars of resistance. “A nation which cannot stand on its own feet and just waits for help does not deserve to enjoy independence,” said Ho Chi Minh. According to him, primary reliance on the people’s power was first and foremost reflected in possessing revolutionary guidelines of independence and self-mastery. Only by doing so could we make the most of the all-people strength to launch wars of resistance, liberate our country and defend the Fatherland. However, “primary reliance on the people’s power” did not mean self-isolation but full exploitation of international assistance and solidarity, and combination of national power and power of the times with the aim of generating the most powerful integrated strengths for the victory of the revolution. He reminded us that courting international assistance was a vital issue. Nevertheless, we could not depend on this support because it would have influence on the country’s independence and self-mastery. Ho Chi Minh also specified clearly that friends of the Vietnamese revolution and each war of resistance were revolutionary forces and movements from the national level to organizations and individuals aspiring to peace and opposing wars all over the world, including people from countries waging war on Vietnam. Furthermore, it was important to clearly distinguish between friends and foes, and adopt the ‘more friends, fewer enemies’ policy. His above-mentioned viewpoint provides a solid foundation for our Party’s current guidelines on the all-people national defence, self-mastery, self-reliance, resilience, increased modernization, and proactive and active international integration. 5. Ho Chi Minh’s thought on leading the execution of the people’s warfare and building the people’s armed forces – pivotal factors in the success of the Vietnamese revolution. One of the most prominent, enduring standpoints in Ho Chi Minh’s thought on military and national defence is to firmly uphold the Party’s leadership over the people’s warfare and building of the people’s armed forces, and regards it as the key principle and factor in the success of the Vietnamese revolution. During the wars of resistance against foreign aggressors, the Party’s leadership was displayed through setting out sound guidelines and policies to garner strength of the whole nation and combine national power with power of the times to overcome every difficulty and obstacle for final victory. Only under the auspices of the Party did the wars of resistance really become invincible, just people’s wars. Moreover, strengthening the Party’s leadership over the development of the people’s armed forces, particularly the VPA, has been a decisive factor in ensuring their constant nature of the working class and profound qualities of the people and nation; their worthiness to be a political, combat force absolutely faithful to the Party, State and people; and their preparedness to fight and sacrifice for independence and freedom of the Fatherland, socialism and happiness of people. First, determining subjects of national defence (in Defence Strategy) and adversaries (in Military Strategy) must be accurate but very flexible, clearly reflecting the guidelines of “more friends, fewer enemies,” “making an enemy of no one,” and taking every chance to isolate and split the enemies. In the period of international integration and intertwined strategic contexts, the grasp and good realization of the Party’s guideline on partners and adversaries according to the spirit of Resolution of the 8th Plenum of the Party Central Committee (Tenure XI) on “Strategy to safeguard the Fatherland in the new situation” are also the sensible, creative application of Ho Chi Minh’s thought to the development of Vietnam’s Defence Strategy and Military Strategy in the new era. Second, special attention should be paid to perceiving and applying Ho Chi Minh’s thought on military and national defence to proper determination of fundamental guidelines and principles of the Defence Strategy and Military Strategy. Notably, it is imperative to thoroughly comprehend the viewpoint on building the all-people, comprehensive, independent, self-mastery, self-reliant, resilient, and increasingly modernized national defence in the period of international integration. The national defence still has to rest on the foundations of “taking people as the roots” and “a national defence of the people, by the people and for the people” no matter how modernized it is. Against the backdrop of developing the socialist-oriented market economy, it is important to renovate mechanisms and policies to channel national resources to national defence. That is also the guideline on building the revolutionary, regular, elite, and gradually modernized VPA with some services, arms and forces advancing straight to modernity; strong politics; increasingly improved integrated quality and combat power; readiness to firmly protect the Fatherland. Third, continuing to creatively apply Ho Chi Minh’s military thought to determining connotation of the task of developing Vietnam’s military art in each strategy. Many new forms of warfare and combat methods have and will come into being, such as cyber operations, use of biological technology, nanotechnology, genetic technology, artificial intelligence, etc., in the world and the region. Against such a backdrop, the determination of combat methods in each form of warfare and strategic operation in the Military Strategy should combine tradition with modernity and coordinate force build-up, establishment of postures, exploitation of opportunities, and use of stratagems in war, and has to be carried out on the foundation of people’s warfare in the new conditions. This is a matter of paramount importance, since, in the coming time, despite our military’s increased modernization, we are still unlikely to keep pace with the adversaries. Consequently, it is imperative to continue to discover new methods with a view to being prepared for arming the whole people if wars occur. Fourth, in the context of globalization and increasingly deep international integration, development of the Defence Strategy and Military Strategy needs to apply Ho Chi Minh’s thought to the exploitation of internal and external strengths (through international cooperation) to strengthen power of the national defence while creating a peaceful, stable environment conducive to national development. In order to implement that standpoint, it is necessary to proactively and actively promote international integration in the realm of national defence; consolidate relationships and establish strategic trust with all nations, especially the neighbouring ones, strategic partners and comprehensive partners; take advantage of international support to deter and repulse risks of war; and adopt the stratagem of strongly defending the Fatherland far ahead right in each strategy. Fifth, strengthening the Party’s direct, absolute leadership over every aspect, and improving the efficiency and effectiveness of the State’s centralized, unified management of national defence should be considered one of the most crucial pieces of content of the Defence Strategy and Military Strategy. There is a need to continue to renovate organization, modes and mechanisms of leadership of the Party and the State’s management; and supplement and perfect legal norms to institutionalize the aforementioned principles in the new conditions. Apart from building the national defence, it is imperative to actively combat allegations distorting the Party’s leadership, “depoliticization” of the VPA, and the acts of sowing division between the Party, State and people and the armed forces. Sixth, discourse on the method of applying Ho Chi Minh’s thought on military and national defence to planning the Defence Strategy and Military Strategy must be creative and developmental in accordance with new conditions. The creative application and development must be firmly grounded on Ho Chi Minh’s thought. To realize the aforementioned principles, it is necessary to regularly study to have a correct, deep understanding of his thought. Learning is not just to know but, more importantly, to apply to practical activities in a scientific, effective manner. Ho Chi Minh’s thought on military and national defence represents a precious treasure and the ground for developing Vietnam’s Defence Strategy and Military Strategy in the new era in the most scientific, revolutionary manner. Perceiving and applying Ho Chi Minh’s thought not only ensure the competence of Vietnam’s Defence Strategy and Military Strategy in meeting the demands and missions of safeguarding the Fatherland in the new situation, but serve as a way to keep him living forever in our cause.